Stroller skating . . . a variation on our daily walk. When one person in a family adopts healthy diet and exercise routines, a funny thing happens . . . the effect spreads to the rest of the family. If that family member also happens to be the main cook and food provider for the family, the impact is especially strong. There is a saying that children learn in 3 ways . . . by example, by example and by example. 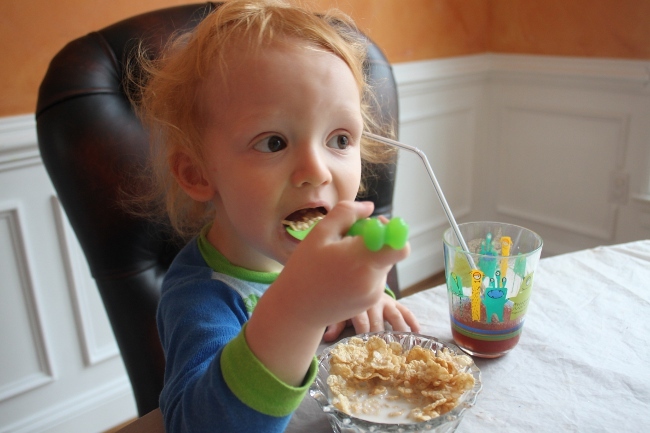 You can hardly expect your children to eat well or exercise when you, the parent, don’t. In my household, my healthy eating habits last month didn’t really encourage the children to eat salad (wouldn’t that have been a miracle!) but it did get them thinking about which foods are healthy. They also liked to police which foods I could and could not eat when I was on my diet. But there were a few changes my children were open to . . .
My eldest daughter is the biggest fan of Cheerios as a snack. She loves to eat it dry. We get the plain Cheerios but even the plain variety has a little sugar in it. I wanted to switch her to something that did not have any sugar in it because I figured that must be healthier. After some thought, I decided to try mini shredded wheats (the unfrosted, plain variety). Since my daughter had seen by example all the sacrifices I had made to eat healthier, she understood that eating healthier foods was important. So, she didn’t dismiss the idea out of hand and, to my great surprise, she liked them! She calls them “crispy wheats” and all of my children enjoy eating them as a snack. What is the health benefit of this switch? Just like the Bisquick versus whole wheat pancakes question, it isn’t entirely clear cut. 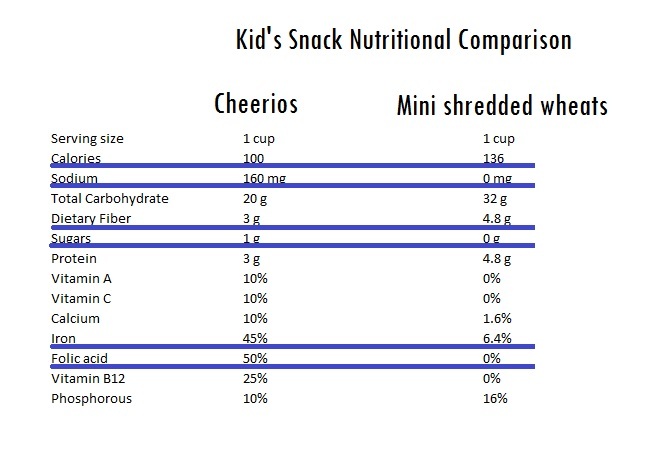 Cheerios have fewer calories and are enriched with more vitamins and minerals, especially iron and folic acid. 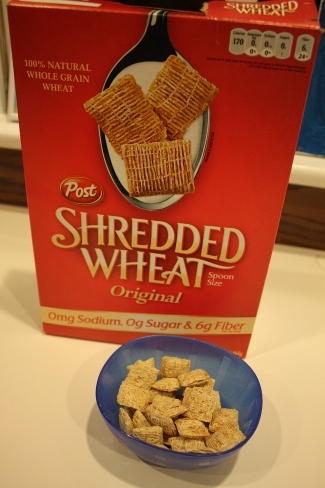 Shredded wheats, however, have lower sodium, no sugar, more protein and higher dietary fiber. For now, we still buy both cereals. If nothing else, it helps to expand her notoriously picky palate. For my 4-year-old fan of mac n’ cheese, she picked out herself a variety of mac n’ cheese from the grocery store shelf that claimed to have vegetables in the pasta! I purposely didn’t point this fact out to her and just said, “OK, that looks good!” and cooked it up for her. It cooks up exactly like regular mac n’ cheese. The only difference is that the pasta has cauliflower in it! We made the healthy version of the recipe on the box that has less butter and milk than the regular recipe. 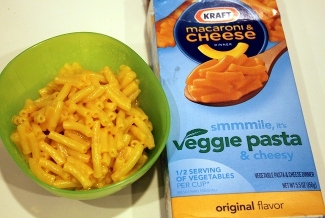 It tasted delicious and I noticed no difference between veggie and regular mac ‘n cheese. My preschooler loved it too! *Note: There is a current petition in the blogosphere to have Kraft remove all food dyes from its mac ‘n cheese. From my own experience, my kids won’t eat mac ‘n cheese if it is not the right color, i.e. unnaturally bright orange. Nobody is pickier about what food looks like than kids! Note that Kraft responds that it already makes 14 different varieties of its mac n cheese that have no dyes or natural food dyes. So, there is a mac ‘n cheese for everyone! What was the health benefit of this switch? The health benefit is not as large as I would like but still an improvement. The cauliflower pasta has less sodium, three times the dietary fiber and is more enriched with Vitamin C, and iron. On the downside, there is more sugar in the veggie pasta and the calories are about the same. 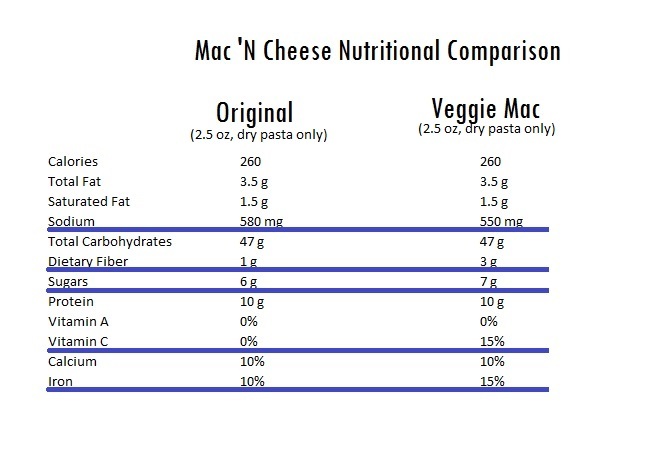 Mac n Cheese may not be the healthiest choice in general but if you are going to eat it you might as well go for the biggest nutritional boost you can get. 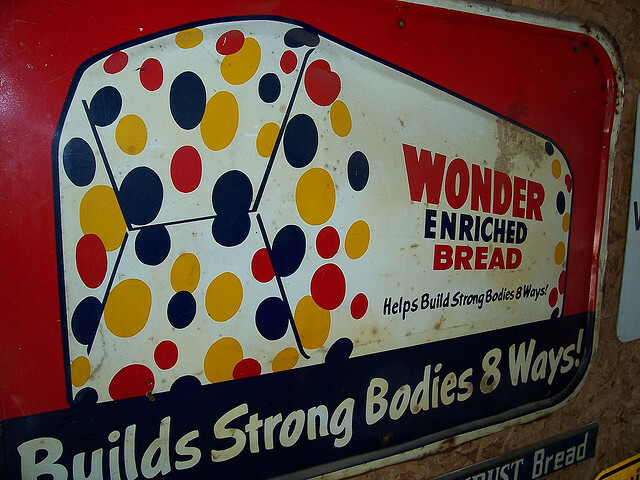 There may be other varieties with even more nutritional content than the veggie version. My children drink a ton of milk every day. Not chocolate milk, mind you, just the plain white stuff straight out of the milk carton. They drink soda only occasionally and rarely drink juice. Since they drink so much milk, I thought it might be a good idea to switch to skim milk from the 2% we were drinking. 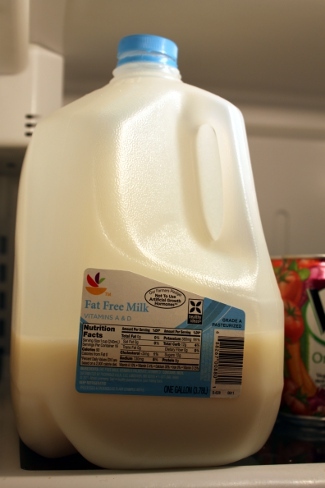 If nothing else, it saves a few calories for all of us as well as a few dollars at the grocery store, since skim milk tends to be the cheapest. 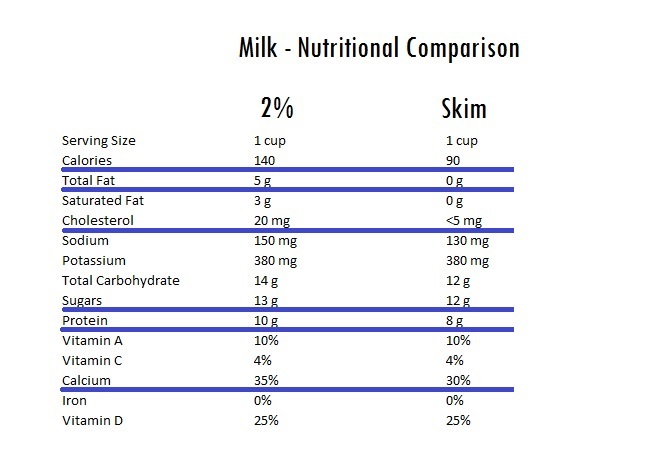 The skim milk has fewer calories, fat and cholesterol but also less protein and calcium and (some say) more sugars. With the large quantities consumed in our house, the fewer calories probably has the edge for us but every situation may be different. Recent research seems to say, however, that the fat content in the milk you feed your children has almost no impact on their weight and that, in some cases, low-fat milk could increase your child’s chances of being overweight or obese. Low-fat milk alone cannot cure other problems in your child’s diet and exercise program and full fat milk might help children feel fuller and eat less of other high calorie snacks. The other big change we made in our house was for me to start walking 1 mile a day with the children. 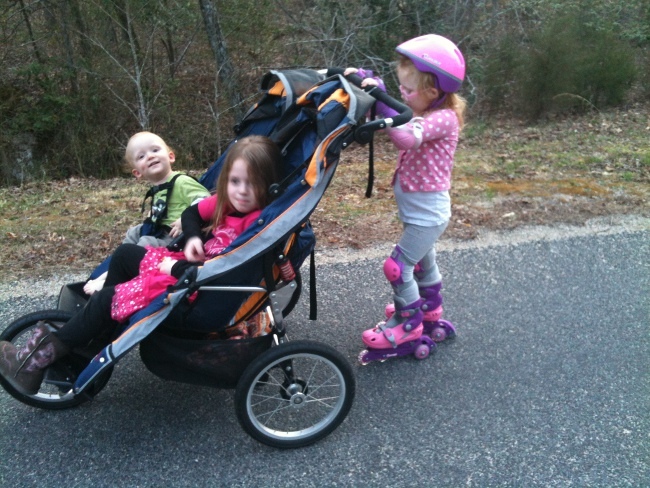 My little one rides in the stroller and his big sisters take turns riding with him when they need a rest. Sometimes they run, sometimes they make me run, sometimes they skate or bike. When he can, my husband joins the fun and we all go together. It is a relaxing way to connect with the family. Since the children walk at an erratic pace, we are not going for aerobic intensity but it is helping everyone to relax and enjoy the outdoors. Have you implemented any diet or exercise changes with your children? Do you find nutritional guidance as confusing as I do? Please share in the comments. 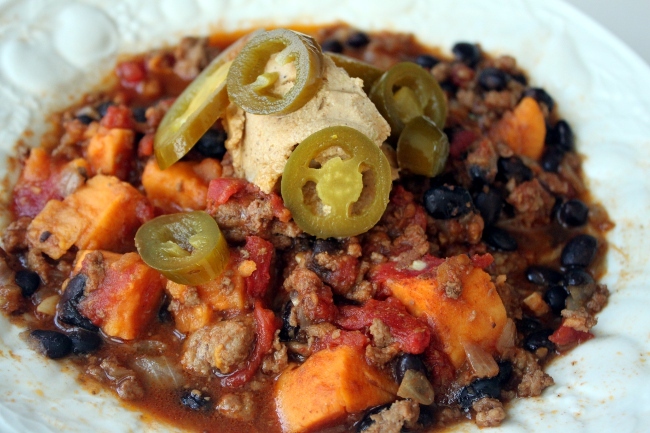 The Dieters Dilemma: Eat What You Want or When You Want?